I admire women who have a signature scent. Their dedication, loyalty and simplicity astounds me because I have never even considered loyalty to one fragrance - probably that Gemini thing popping up its head again. I love the idea of experiencing a person as a fragrance. In fact one of my favorite people on the planet, my dear grandmother, has a signature scent. It is First, by Van Cleef & Arpels. When I asked my grandmother to tell me how she discovered the scent, she described sniffing it on her sister-in-law, my aunt Monique, with whom she is very close. Aunt Monique grew up in France and has always had impeccable, European taste. I remember visiting her house as a child and being so impressed with all of her interesting knick knacks, her detailed china cabinet and most of all her "cuckoo" clock. Her home contained such unique things to do and look at compared to our home. I would sit for a half hour to watch the cuckoo bird chirp at each fifteen minute interval, drawing the most excitement from 12 o' clock, hallmarked by 12 chirps. Add Aunt Monique's French taste and sensibilities to a short career at Neiman Marcus, and I am certain she always discovers the most wonderful scents to wear. When my grandmother initially noticed First on her and fell in love with the sparkling floral fragrance, she asked immediately what it was. After discovering it was First by Van Cleef & Arpels, she decided to buy some for herself. Although she was a little disappointed that its scent developed differently on her skin than aunt Monique's, First fit her - sparkling, light, buttery floral and feminine. Since then, to my nose First has become the fragrance that is my grandma. She calls it her signature scent, although she has worn Chanel No. 19, Chanel No. 22 and Chanel No. 5. However, she rarely if ever wears those anymore. She has a bottle of First in her summer and winter home and in her suitcase so that she is never without it. She describes it as "light, pleasing, not overbearing." I describe her as light, pleasing, not overbearing and energetic, beautiful, sweet, warm and always kind. Unfortunately, we live far away from one another so I cannot enjoy being around her as much as when I was a child. First was the second fragrance created by Jean-Claude Ellena but the first to achieve great success. Launched in 1976, the year of the grand United States Bicentennial celebration, First quickly gathered a loyal following. Upon inhaling its smooth and sweet bouquet, the reason it did so becomes quite apparent. First was created by Parisian jeweler Van Cleef & Arpels to be a jewel-like fragrance and quite possibly to augment the beauty of his jewels. What a perfect fragrance to epitomize my grandmother, a woman who undoubtly sparkles and shines to anyone who meets her. First is built upon a dazzling note of jasmine, with soft aldehydes to add sparkle and blackcurrant buds for piquancy and energy. I detect buttery tuberose as well, which gives the fragrance multiple dimensions. I also detect a mandarin note in the opening which reminds me of my grandmother's sunny and warm disposition. The perfectly budding, glorious flowers lie on a base of amber and sandalwood. The entire composition has a seamless quality to it, preventing any one note from taking front and center. Rather, they each shine at different moments, like the various facets of a diamond that together create one luminous sparkle. In fact, when I discovered jasmine is the principle upon which First is built, I was surprised since I often think of jasmine as too cloying and sweet. Not so here, thanks to Jeane-Claude Ellena's mastery. I am perfectly content letting my grandmother call this perfect-for-her aldehydic floral her own. I have plenty of others to wear. Although, on those days that I am missing her and longing to be in her warm and comforting presence, I dab a little First on my wrist and inhale its resplendent beauty ... and her brilliant soul appears in an instant. Please be sure to check out Divina's pick for our "Forget Me Not" feature, Lanvin Arpege, at Fragrance Bouquet. First is available in Parfum, Eau de Parfum and Eau de Toilette (my grandmother's choice) at select department stores and at various online discounters. Image of bottle courtesy of fragrancycity.co.uk. 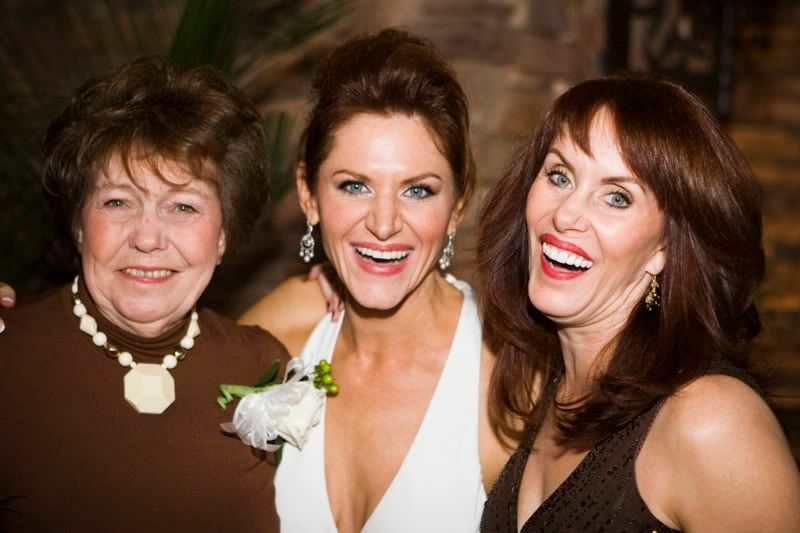 My own image of my grandmother, me and my mother at my wedding reception. Have a wonderful day my friend and thank you so much. But I think my grandma is the beauty of the bunch. Thank you greeneyes. :-) My grandmother is such a gem, she deserves many tributes! First is one that must be smelled, if you haven't yet. It is so classically beautiful, without the aldehydic punch of Chanel No. 5. The aldehydes are much softer here and it's just as beautifully composed as the Chanels. Have a great evening! A gorgeous homage to that wonderful woman. A beloved friend of mine wore this for years- so, it's hers by right, and by memory, for me as well. You remember when she had surgery last year and how scary it was for all of us. She's such a trooper! This kind of scent begs to be a signature for a special woman, don't you think? I wore First fairly frequently through the 80s. I sure hope this subtly elegant perfume remains available. It is truly lovely, as is your grandmother.